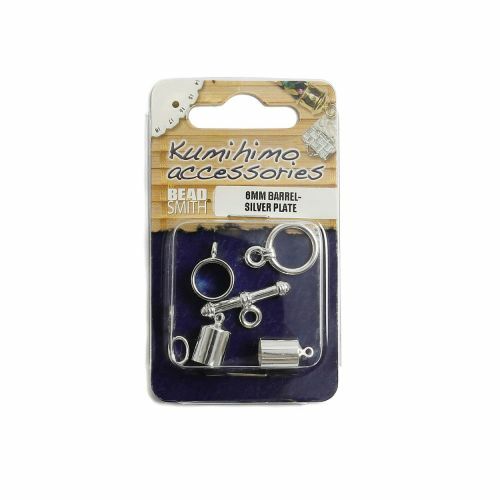 A great Silver Plated Findings Set for Kumihimo braiding with Barrelends, containing all you need to give your kumihimo braid a really great finish. The 6mm size is great for those braids using 1mm or 2mm rattail, and there are instructions on the back of the pack for the best way to finish your cord ends. There is a clasp includes for securely wearing your braid. These findings are to fit 6mm cord. Each pack contains; 2 barrel ends, 2 jump rings, 1 toggle clasp and 1 pendant slide. CommentAll products were excellent . Will resume ordering in the future THANK YOU VERY MUCH . Commentreceived with several items, excellent fast service.